To begin with I have taken photographs of a wide sweep of the area to ‘lay the ground’ as it were and to see what is emerging. There’s still a part of me that worries that this is too small an area to cover in a longer project but I reassure myself that “the assignment should address the notion that the landscape is an evolving, dynamic system”, and I may, “ wish to confirm, question or subject this assertion” and I should certainly end up with sufficient material to do that. I can see how I am recording some of the same locations through time and season, including the play area (sans children), people passing through the landscape and some smaller details of graffiti, moss on branches, or leaf patterns. I have also been thinking about change of use – how the calendar dictates whether football or cricket is played and how the seasons dictate the types of clothing we wear. I’m definitely at the stage now where I need the discussion with my tutor to help me clarify my thoughts and discuss possibilities. This entry was posted in 2. 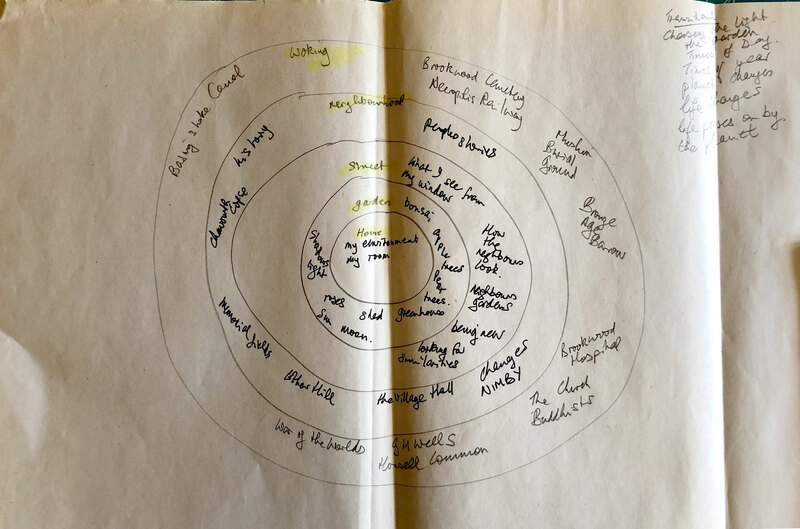 Process of Assignment 6, i. July 2018 to February 2019 on February 12, 2019 by Catherine. As mentioned before I have decided to shelve the idea of photographing my garden for this assignment although I will still continue to make photographs here for my own use. Instead I will be using my visits to Ottershaw Memorial Fields and adjacent Queenswood and Ether Hill to record and reflect upon the transitions there. Below is the mind-map that helped me to make the decision. The playing fields commemorate the dead of World War 2. The area is home to a number of local sports clubs (including being the home base for Ottershaw Football Club); a children’s nursery; Ottershaw Scouts and Guides. It has a Children’s play area picnic benches, football and cricket pitches; tennis courts and a bowling green, is now used for a Saturday morning Parkrun and, In the past, I have also seen some people practising Tai-chi and others flying small birds of prey on the field there. The field is also the venue for the annual May Fair. Ether Hill and Queenwood are adjacent to the main park and that is where I regularly walk with my dogs. The site is owned and cared-for by Runnymede Borough who ae currently in the midst of their five-year plan to enhance the areas as Suitable Natural Greenspaces (SANGs). 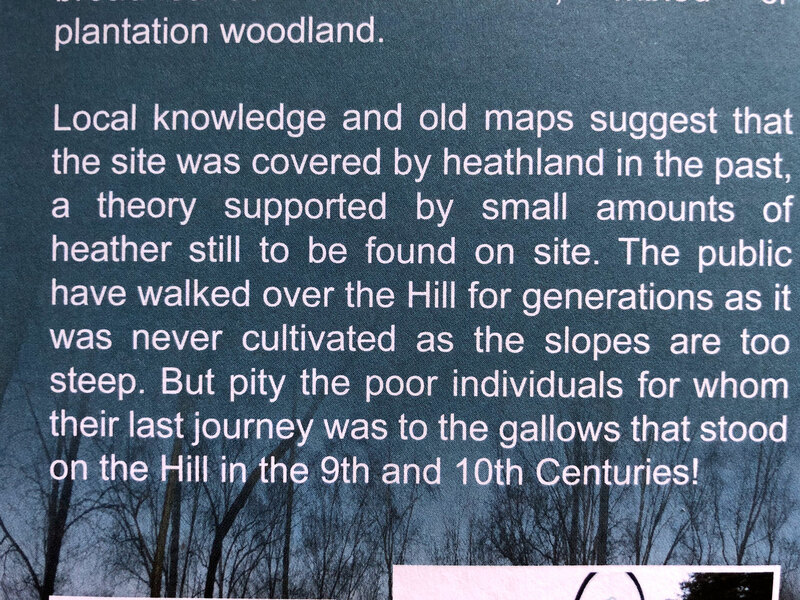 Some recent, very nicely printed, information leaflets inform me that the network of informal paths provide views over the countryside from the top of Ether Hill (depending on the Season I’ve found!) and most of the site is covered by either broad-leaved semi natural, mixed or plantation woodland, including Scots pine which grow well on the sandy soil and give the Hill a distinctive skyline. During the past year a lot of work has been done by the Council and volunteers to clear many invasive non-indigenous rhododendron bushes to open out the area so that small patches of bell heather and ling will thrive and increase the biodiversity of the site. The hill was never cultivated as its slopes are too steep. I mentioned here reading a story in the Parkrun blog that gallows once stood on the hill in the 14thCentury. I’ve still been looking for the truth and here the story is again but in a different Century – in fact two! This time it’s in the ‘official’ printed leaflet, although I’m not offering it as evidence for the ‘truth’. It just shows how stories like these linger down the centuries and also shows how stories whether true or fiction become woven into the fabric of our environments – particularly amongst trees. Thinking about stories, leads me into the idea of Landscape as a stage and the work of Simon Roberts. Simon Roberts produced a video series, in two parts, Sight Sacralization: (Re)-framing Switzerland which fits very well with the Sublime and how we attempt to capture ourselves – or should I say ourselves within – as part of it perhaps. Each film is in the same location (I think) one in Summer 2017 and the other in winter 2017 and, of course, fits within the theme of “Transitions”. In his own commentary here Roberts describes the Swiss landscape as resembling a theatre set where tourists are both performers and spectators. This theme is something he has returned to again and again – how different people use the same space and how the landscape is used and commodified – his interest being in human presence in a space. I’m also interested in landscape as performance – how we enact aspects of ourselves within it. For the past few years there has been a continuing ‘art’ of erecting and installing tent-like twig/branch structures and last year saw the arrival of small painted stones being hidden around, collected, and re-installed in other places – some many miles away. There seems much to portray although, I should add, only in small amounts. I have collected together photographs taken there since July last year when I explored the idea of Viewpoints – shelved at the time because there wasn’t a view at the Viewpoint but, with Winter, something has slowly been revealed. Another photographer who continues to interest me is Susan Grangmar. Her project A Play in Time covers a year spent filming in St Ann’s Park, Hove to observe how the park was affected by the changes of season and weather; resulting in a book and video film. In a conversation with Rebecca Drew, printed at the end of the book, Trangmar talks about the film which, “[…] is not constructed on this basis as a chronological cycle, but jumps backwards and forwards in non-linear fashion”. Tranmar goes on refer to the pressure to be inclusive with a long time- frame in a park with, “such a dynamic place of public ownership”, but that she, “[…] had to construct a piece of work which had its own internal rhythm and shape”. I think this an important point to remember with a lengthier project. More recent work by Trangmar is recorded here including A Forest of Signs which explores the way in which urban street trees serve different purposes – markers of place, register of time passing or object of reverie. I have been able to access a very interesting essay where Trangmar creates a dialogue between her project and Virginia Wolf’s writing of London life with trees as a metaphor. I will write more on this in a later post together with notes on several other artistic and literary influences. This entry was posted in 1. 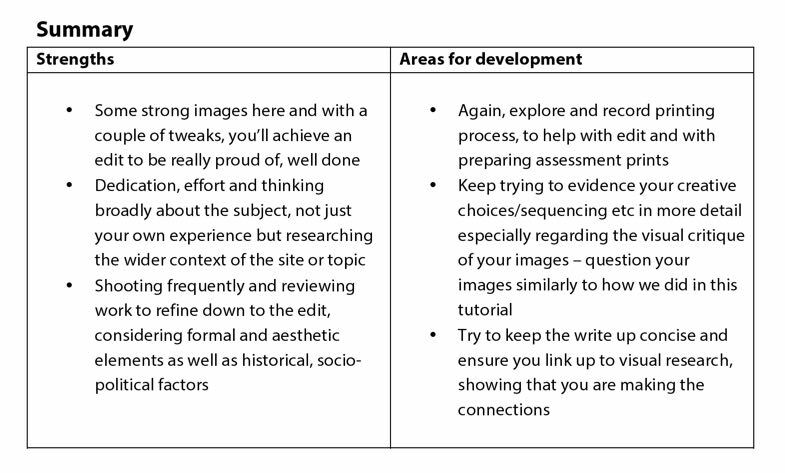 Planning for Assignment 6 on February 12, 2019 by Catherine. I actually made several journeys interwoven between past and present just like the ribbon of the Basingstoke Canal as it wends its way through the landscape. In addition to the two walks, I journeyed into the past through reading and imagination and both explored and challenged some of my own opinions about some of the ways in which Woking manages its environment and amenities. 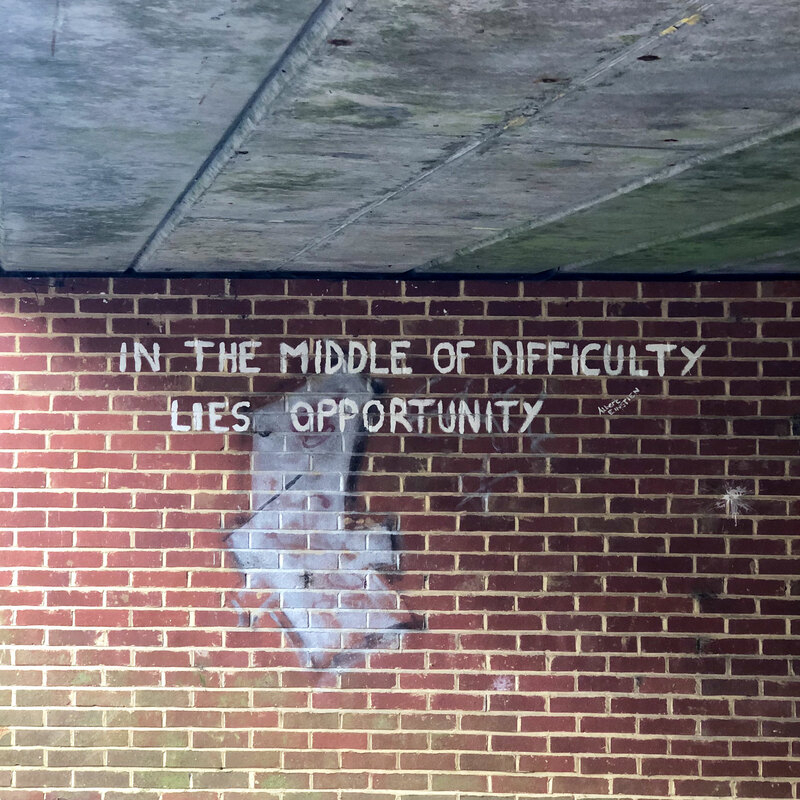 I lived in the Woking Borough area from 1986 to 2013, albeit in different locations but then moved only a few minutes down the road into another Borough which is different in ‘character’ and government – although not hugely. Whereas as previously I experienced Woking as a resident I now do this as a visitor. My opinion of Woking has always been that, if it was a person, it would be continually trying to improve itself but not always successfully, especially in relation to the Town Centre. I’ve always thought it more drab and less sophisticated than its more glamorous nearby neighbour Guildford which has its Cathedral, University, old buildings and cobbled Centre shopping street with more high-end department stores and shops/boutiques. When I first decided to walk along the Basingstoke Canal from Woking, I decided I would approach this with as open a mind as I could, saving the historical research and reading until afterwards. I’m pleased I did. My later reading of the earlier history of the Basingstoke Canal tended to prove my opinion about the negative aspects of capitalism – the looking for a profit for self-gain, lack of awareness of the impact of decisions and carrying on regardless with a project despite evidence that it wasn’t working. However, this was tempered by my deeper understanding of all the work, effort, determination and financial contribution made by two County Councils, local Councils and voluntary bodies to reinvigorate, indeed rescue the Canal from its slow dissolution back into the earth and turn it into an amenity that could be freely used and enjoyed. Of course, my walks were out of season and seasons change behaviours. I’ve already decided to take a boat journey to see the canal that way. It could even be turned into a longer-term project through travelling further along it. There’s lots of scope there. I seemed to have a lot of images to choose from which was good. My major concern is that they could seem too ‘pretty’ and travel poster-ish, although as I wrote in an earlier post it’s hard to avoid that on that particular stretch. Some people might say the canal is too sanitised and unreal now. I’ll have to see if that fits if I explore further. The Assignment brief suggests about 12 images to be submitted. In fact I’ve left it at 15 in the final selection as it was so hard, including leaving out some of my own favourites. 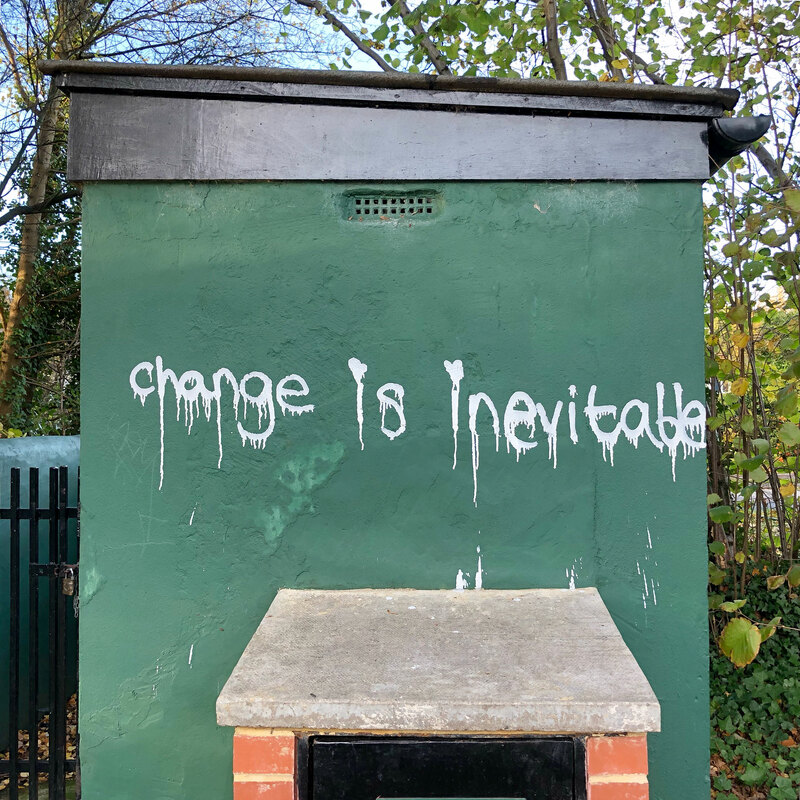 As I’ve written previously, I decided to exclude graffiti and litter – not because I didn’t want to spoil the view but because there was hardly any of it at all. A Reflection post will follow. This entry was posted in 3. The Final Selection on February 2, 2019 by Catherine. Although I’d read around this topic quite a long time ago I waited until until I’d finished the photography sessions to read again and further as I wanted my mind to be clear to the present moment. During the late 18thCentury the growing industrial revolution was beginning to transform people’s lives. Steam engines were beginning to transform industry. Britain had built up-a large overseas empire. Owning land was the main form of wealth and groups of rich men had already formed turnpike trusts to improve and maintain certain roads – tolls having to be paid to use them. There was money to be made and, of course, wasted as The South Sea Bubble had already shown early in the century http://www.thebubblebubble.com/south-sea-bubble/ – an early version of the technology shares crash in the early 2000s. To cut a long story short, the Basingstoke Canal Navigation Company went bankrupt in 1866, with seven owners during the next fifty years each finding the canal to be nothing but a financial liability – factors being the eclipse of most of the national waterways system as a result of the development of road and rail transport; the decline of both industries and the importance of agriculture in the South and larger /cities such as London and Bristol bringing in produce from other parts of England or abroad rather than from neighbouring counties. Commercial traffic on the Basingstoke Canal gradually dwindled – the last load of timber delivered on its route being in 1949. By the 1960s the Canal, closed completely, had become weed-choked and silted, with crumbling locks and an overgrown towpath. Work began, in 1973, to totally restore the canal, after years of campaigning and lobbying by those determined to give new life to it. Hampshire County Council bought one stretch in 1970 and, in 1976, Surrey County Council purchased the rest of the canal between Woking and Frimley. The work took 15 years to complete, was supported by armies of volunteer labourers and publicised by boat rallies and events. It was formally reopened in May 1991. Between 2008 and 2011 a sustainable cycling town project was delivered within Woking, with the emphasis on connecting people with places, using sustainable modes of travel in walking and cycling and connecting to public transport for longer journeys. 26.31km of new off-road cycle network was constructed, with 12.9km along the Basingstoke Canal (The Saturn Trail) being ‘the jewel in the crown’. Even though I found the note recording tedious at the time I realise I gained a great deal of inspiration from the Projects/Exercises in Part 2. Throughout the process of the Assignment I had in mind those words of Mark Titchner (see here) about gathering ideas together on how a City (or Town in my case) brands itself and how that can reflect on me as a resident; to source background material; see how historical areas have changed, and view the City as a non-static evolving place. Titchner also uses as few words as possible to allow space for the viewer to insert their own meaning. His other sentence that really impacted on me was “The World isn’t working” – against something that someone else had said “Every problem has a solution”. The latter sentence is quite often used in business, but it had much force when said to me by a tour guide in Canada who was a member of its First Nations people and very much involved as a mediator between them and the Canadian Government. When I did the reading for the Edgelands Exercise (2:6) (see here) I also looked at Farley and Roberts chapter on Canals (2011: 117) and how canals are uniquely “able to offer a portrait of the decline in manufacturing, and the shift of power from water and rail to road” and how they now lead a double life, being adopted as natural features in the countryside, being associated with tranquillity and leisure, whereas in urban areas they are often ‘wet skips’. Therefore, I was alerted to seeing such changes on my walk. On the short stretch I walked there wasn’t much opportunity for creating any ‘land art’ in the sense that, for example, there were no flowers to gather/arrange and, to my pleased surprise, hardly any litter to portray as a blot on the landscape. Also, there was nowhere to sit apart from at the Woking junction with the path. What I’d had in mind was the work of Stephen Turner which I’d looked at during my previous Module, having seen work at the Aspex Gallery, Portsmouth, which he’d produced whilst travelling with the Exbury Egg (see here) . What I did do was to create a cyanotype from a digital photograph of one of the buildings. I was quite pleased with the result, especially having exposed the cyanotype in natural, albeit not very strong, sunlight. The exposure took about an hour and a half. Unfortunately, it was only when I looked closely that I realised I had forgotten to flip the negative which meant the building was the wrong way round. I did have another go a few days later having remedied the problem but, unfortunately, it was a poor exposure. On the topic of alternative photography, I had also had pinhole photography in mind for some time, and using an empty drink can, but seeing such a lack of litter along that stretch of the canal has made me think that it might not be a good idea to attempt there. Throughout, I had the work of Simon Roberts, his views of the British at rest in “Merrie Albion”, “We English” and National Property: The Picturesque Imperfect https://www.simoncroberts.com/work/national-property/ and his concept of the landscape as a stage on which people enact their lives and this is something I know I will carry forward in future assignments. Amongst others my tutor pointed me towards Michal Iwanowski’s work Go Home, Polish which ponders on where home is and geopolitical agendas from the perspective of each individual. On a smaller scale both these topics are very relevant to me, given that I have moved house and place quite often. There is something within me felt as ‘home’ and this does link for me with Mark Titchner’s thoughts on how the way a City brands itself reflects on me as a resident together with how, in many respects, I become an observer of ways in which a community is affected by political choices. My tutor also referred to Paul Gaffney whose work I have seen beautifully presented in its soft-covered book. He chose his path, whereas mine on the canal was pretty much laid out in front of me, although I did have a look up some of the paths to the road. The most important aspect though is that Gaffney’s work has a slow, visually lyrical effect for me with no people and just the spaces, which I could equate with slow art and slow walking. In terms of eventual presentation of the Assignment my first thought was a concertina book as this mirrors the ‘ribbon’ of the canal within the landscape. I also appreciate the work No Sign of Canals on Mars: The Illustrated Travel Diaries of Eileen Burke by Tim Daly (Fugitive Press) . The work includes wool, postcards, a diary, various ephemera and c-type prints in a wallet. All placed in a small archive clamshell box. A wonderful illustration of how ‘souvenirs’ can be put together to create a whole. Again, probably not practicable from a short walk but that approach is on my presentation ideas list. This entry was posted in iii.Context on February 2, 2019 by Catherine.